A man played slot machines during the early morning hours at Plainridge Park Casino in Plainville in June. Gambling revenue at Plainridge Park Casino dropped significantly in December, marking the fifth straight monthly decline since the Plainville facility opened last year and lending support to the perception that gamblers are bypassing it for a larger casino in nearby Rhode Island. In December, Plainridge collected $11.2 million, down by about $700,000 from November and by almost $7 million since July, when the casino hauled in $18.1 million in its first full month of operation, according to figures released Friday by the state Gaming Commission. 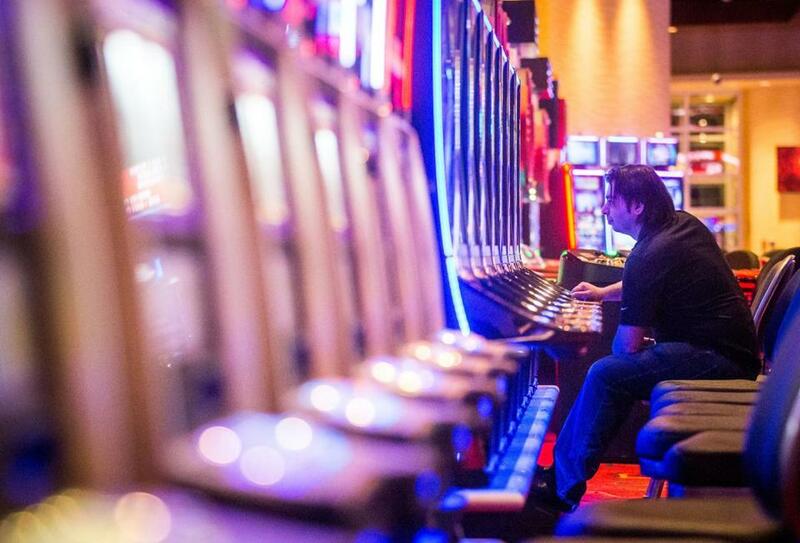 Before Plainridge opened, gambling marketing consultants predicted as much as $300 million in revenue in the slot parlor’s first year, but in its first six full months of operation, the facility has picked up only $82 million, on pace for $164 million a year. While gambling specialists say December is generally an off month for casinos, the overall trend at Plainridge has prompted some to wonder what has gone wrong. “We don’t know why” it’s underperforming, Crosby said in the interview on Boston Public Radio. He added that “it’s too soon” to draw any conclusions based on what’s happening at Plainridge on how well other casinos planned for Massachusetts may fare when they open, now scheduled to be in 2018. Crosby, responding to questions from interviewers Margery Eagan and Jim Braude, said Plainridge, about 35 miles southwest of Boston, is at a “tremendous competitive disadvantage” with Twin River Casino, just 11 miles away in Lincoln, R.I.
Twin River offers more than 4,000 slot machines, table games, and a 3,000-seat arena, while Plainridge is limited under state law to 1,250 slot machines and no table games. Twin River also allows smoking and gamblers age 18 and older, while Plainridge bans smoking and anyone under age 21. Asked whether he expected Plainridge’s owners to go to the state Legislature for a tax break, Crosby said they have the right to do so, but “I find it highly, highly unlikely” that the Legislature would grant a tax break. The state taxes Plainridge’s gambling revenue at 49 percent. Most of that tax revenue, about $35 million since the facility opened on June 24, goes to aid towns and cities. The casino law also requires that a sizable chunk — $8 million, to date — go to prop up what’s left of the state’s horse-racing industry. State officials were counting on Plainridge to generate $128 million in annual tax revenue, but based on the weaker-than-expected performance they have recently lowered that projection to $78 million. Of three resort casinos allowed under the 2011 state casino law, only two are in development. It remains unclear whether the Gaming Commission will issue a license for Southeastern Massachusetts. And both of the projects that are underway — MGM in Springfield and Wynn Resorts in Everett — have been delayed, with the earliest opening now expected no sooner than mid-2018. Plainridge, located on Route 1 about 5 miles south of Gillette Stadium in Foxborough, was supposed to stop the stream of Massachusetts gamblers headed for Twin River. But Rhode Island budget analysts, who had initially lowered their expectations because of the competition from Plainridge, recently added $35 million in overall projected slot machine revenue at Twin River. One Rhode Island official said that Twin River had “blunted the impact” of Plainridge’s opening. In a statement issued Friday, Plainridge’s general manager, Lance George, said the company expected slower business during the Christmas holiday season.